Hi everyone, back for a quick update on the Movember progress. Hope you're wearing your safety goggles! 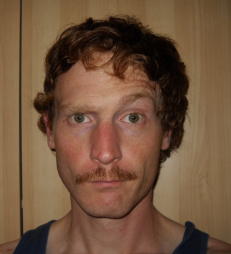 Like an eight-month old baby, the Mo has started to take on some personality. But I think my baby's going to grow up to be a serial killer. Hope you are all doing very well, my friends. Back for more soon! A strange hue to the morning. We go yonks back. But yonks back!